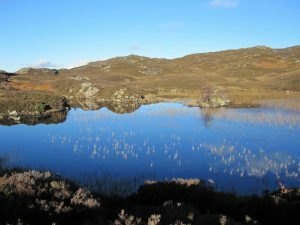 Remembrance Sunday, 10 November, was an absolutely glorious day, crisp with clear blue skies, lakes and tarns like glass and snow on the higher fells. Margaret and Len were with me and we decided to walk to Dock Tarn and Watendlath from Rosthwaite. The ascent via Stonethwaite is a good track but steep: however the views and the amazing autumn colours by Dock Tarn were well worth it and there was even ice on the tarn! The descent from the tarn was icy and very slippery in places and where it wasn’t icy it was boggy! 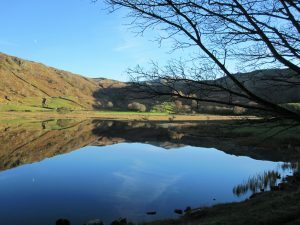 However we were rewarded by the reflections in Watendlath Tarn which were stunning; even the moon was reflected. It was a beautiful day for photographs and I think many people must have some incredible pictures. One of my neighbours, John Macfarlane, sent me a picture of the Loweswater pheasant; it is said that part of Holme Wood was planted to look like a pheasant and it is much more prominent in Autumn when the colours on the trees change. We have now got some snow on the high fells again and nearly all the leaves are off the trees although there still seems to be tree loads blowing through the courtyard! We have also had some very stormy days, last night being one of them! It was the evening for the carol singers to go round the valley and we didn’t cancel, despite driving, soaking rain, debris strewn roads and winds that blew our carol sheets out of our hands.